The poem's scope, even by modern standards, is staggering. Lucretius peers into the secrets of nature with a kind of innocent curiosity and offers a "scientific" explanation for all sorts of phenomena: stars and planets, oceans and rivers, plant life, reproductive activities, the soul and immortality, and the nature of the gods, among others. 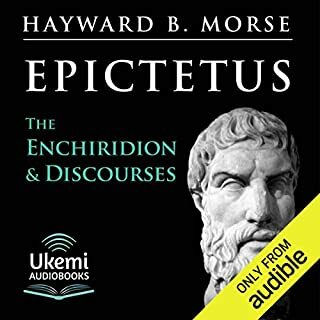 According to Lucretius, mankind can be freed from the stifling structures of religion and superstition by studying the works of the Greek philosopher Epicurus. All it takes is the strength of character to look at the natural world in an uncompromisingly level and unemotional way, to observe and live in the world according to precepts laid down by the great Epicurus in the fourth century B.C. That being so, according to Lucretius, it will be possible for man to lay aside superstition and fear and to become as godlike as he can. Even though humanity was driven by hungers and passions it little understood at the time, Lucretius' bold poem sought to embolden men with the self-confidence to get along in the world without recourse to myths and gods. In order to free themselves, men would have to adopt a personal code of self-responsibility that consisted of living and speaking personal truths founded on the work of Epicurus. On the Nature of Things is about the universe and how men should live in it. As someone who is not fluent in Latin, I have always wished for a way to better understand the Roman way of thinking. I have been put off in the past from De Rerum Natura because the translation that is in the public domain and is all over the internet, by W.E. Leonard, is virtually unreadable to anyone not initiated into the details of Latin poetry. In contrast, the translation used here is eminently understandable by almost anyone. But more brilliant even than the translation is the narration by Mr. Griffin. Lucretius himself would be smiling if he could hear what Mr. Griffin has done with his work. I dare say this production opens the ideas of Epicurus to a whole new generation that otherwise might never have taken the time to get to know this work of art. I have heard it said that the Romans intended their works to be read aloud rather than read silently. 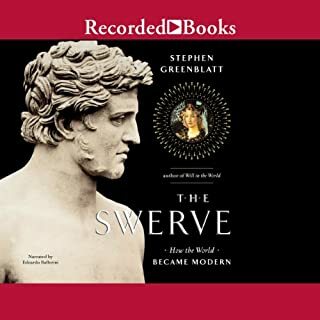 I do not know if that is true, but this audiobook should be exhibit one for anyone who wants to argue in support of that point. 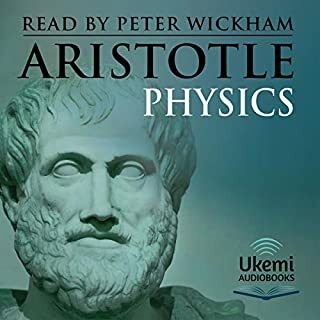 The tone, the inflection, the pacing... all combine to make a complicated subject come alive, as if Lucretius himself were patiently explaining his position to a listening pupil. The ideas of Lucretius and Epicurus merit careful reexamination in the modern world. The fair-minded listener will easily separate Lucretius' errors of fact, which stemmed from the limited state of science, from his far more important method of thinking and approach to philosophy, which need no revision. 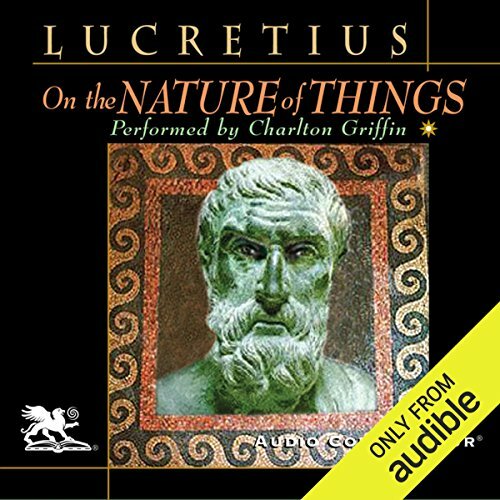 If Lucretius and Epicurus ever get the monumental credit they deserve for their contributions to philosophy, it will be in no small part to this production by Mr. Griffin. To any new student of Lucretius I would heartily recommend this oral presentation over ANY written translation. Simply outstanding. I cannot recommend it highly enough. 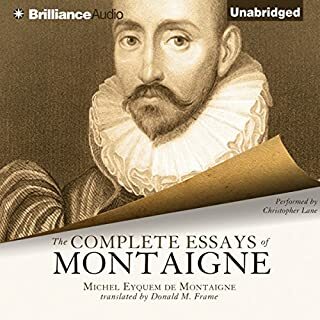 I have several other audiobooks by this narrator and they are all excellent, but of those I have heard clearly this is his masterwork. 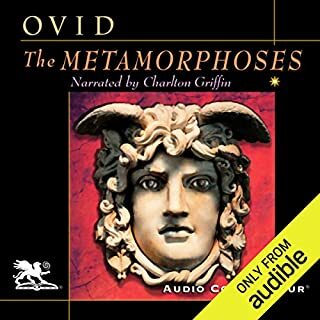 As for the narrator: I've bought quite a few of Charlton Griffin's audiobooks, and there's no denying he's an excellent narrator. He's not my personal favorite, because I find his booming voice a little too, well, booming. I sometimes felt like it was an irate Roman god reading the poem, and not an atheistic poet. Not a real problem, of course, just my personal taste. In short: an excellent poem, beautifully translated, expertly read. I only wish the extra parts were concentrated in one place, either at the beginning or the end. Where does On the Nature of Things rank among all the audiobooks you’ve listened to so far? If there were gods, and humans went to battle against them, win or lose, the story ought to be told by Charlton Griffin. Lucretius' De Rerum Natura is a marvel of poetry and philosophy, but you have to already know your classical poetry and philosophy to really savor every drop. But with Charlton Griffin, even those unfamiliar with the materialism, empiricism, hedonism and atheism of epicureanism, will be inspired to seriously ponder these ideas and read further on. I had read this book before, but this audio version sent chills down my spine! Do yourself and your loved ones a favor, and listen to this audiobook as you sit in front of a nice chimney fire. What made the experience of listening to On the Nature of Things the most enjoyable? First of all, this translation is based on Rolfe Humphries, in case you wish to read along or follow the audio with the book. It is very readable and clear. Griffin is a great narrator; he makes it very easy to follow, especially if you do not have a copy of the book with you. There's nothing to report that has not been stated by previous reviewers. This is a great production of a very important classic. For novelty, beauty and insight into a great Roman mind, this is a worthy purchase. Charlton Griffin is awesome, especially for Roman literature. His bold and assertive style captures the Roman spirit. Also, I hear this is the best translation. Lucretius' introduction, an invocation to Venus, is majestic. I was in the midst of reading yet another book that referenced Lucretius' On the Nature of Things and thought I should stop and read Lucretius' words for myself. WOW. This is possibly THE best book ever written. I am amazed that someone who lived more than 2000 years ago could possess such a deep and complete understanding of our universe. If you change a few words here and there and maintain an understanding that Lucretius wrote this work long before many necessary scientific tools existed, it is relevant today. It boggles the mind that Lucretius, in his own way of describing things, was able to understand entropy, atoms, evolution, superstition, eliminative materialism, philosophy of mind, evaporation, the formation of stars and planets, metabolism, genetics, deletions, and so much more. I always thought of Newton and Einstein as the smartest men to ever live. Some people say it was Aristotle. I think, without question, Lucretius was the most brilliant man to ever live, especially given the tools available and the time period in which he lived. Lucretius, without tools, knew more than many people today, with tool, know. Prior to reading this, I read a biography of Epicurus and Epicurean philosophy. I can see why Lucretius said that Epicurus' brilliance towered over all the other brilliant men. In the end, Lucretius towers over them all. I have a new friend, but he died 2,000 years ago. however, he still talks to us. Titus Lucretius Carus was a Roman poet and philosopher over 2050 years ago. "De rerum natura" ("On the Nature of Things") is his only known work. Lucretius covers concepts of Epicureanism. This reading is from "The Way Things Are: The De Rerum Natura," 1968, translated by Rolfe Humphries. It's easy to hear the words of this great poet of the ancient world and laugh. Laugh because his assumptions about so many things are so wrong, and because the reading here lends the words the authority with which they were written. But it is also easy to look back and imagine a world in which the richness of our modern technological and scientific information is not available and the only means by which to understand the world is to look at it and assume, with some good thinking, what is going on. Yet underneath it all, is Lucretius not right about a great many of the things he discusses? Are his discourses on the nature of the Gods not a kin to what is often accepted by most modern religions? Is nature not composed of smaller and smaller particles, each with their own intrinsic characteristics? Indeed, Lucretius and many of the ancient philosophers are ignored in our modern age, but they should not, for they have much to teach us. 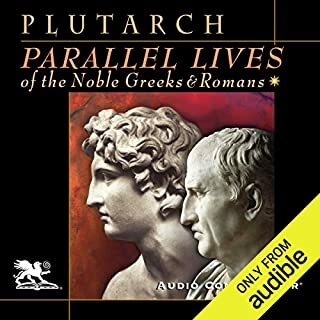 This audiobook makes it easy to not only gain knowledge about one of the often neglected ancient philosophical schools, but the reading is done in such a way as to make it a stern yet pleasant talking to by a favored teacher. You listen and are drawn into it, and if you allow yourself, you are drawn into a different mental paradigm, one in which it is ok for you to feel pleasure, to take enjoyment in life, and to seek to make of yourself a better person, not out of fear of divine retribution, but out of a desire to be a fully realized human being, because that in and of itself should be reason enough.